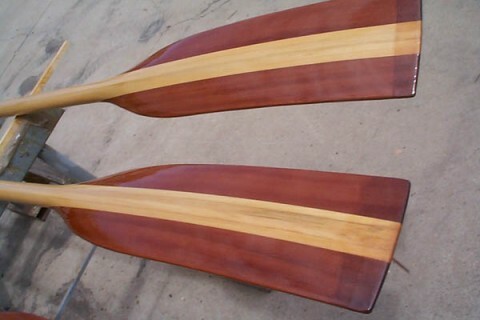 Two pairs of oars (plus a spare) were required for a 15 foot rowing boat. The availability and clear grade SPURCE or OREGON, not to mention the price, dictated us to use clear grade HOOP PINE for the shafts and the cheeks were made from CALIFORNIAN RED WOOD – WESTERN RED CEDAR would also have been suitable or many others. We laminated the 5 shafts using 50/10 mm stock and epoxy. After the shafts have been redressed to 45 mm square, the diameter needs to be determined by craft size and weight – row lock size etc. We marked 450 mm (18 inches) for one end and routed the remainder of each shaft into a round shape. We discussed tapering towards the blade as would have been done traditionally. But we did not have a lathe with a long enough bed available, spoke-shaving would have been O.K. but I decided to use the blades for a while to see how heavy and stiff they seemed and consider the tapering later. We used a heavier cutter for the hand grip to reduce the diameter to under 40 mm (1.5 inches). Next we glued epoxy a 70/40 mm CALIFORNIAN REDWOOD cleat onto either side of the square ever shaft, ensuring the lamination in the pine when “working in the boat” were turned for best effect. The overall width of the blade being approximately 170 mm (7 inches). The general concave/convex faces were cut on our bandsaw then the profile shape was achieved using a jig saw. 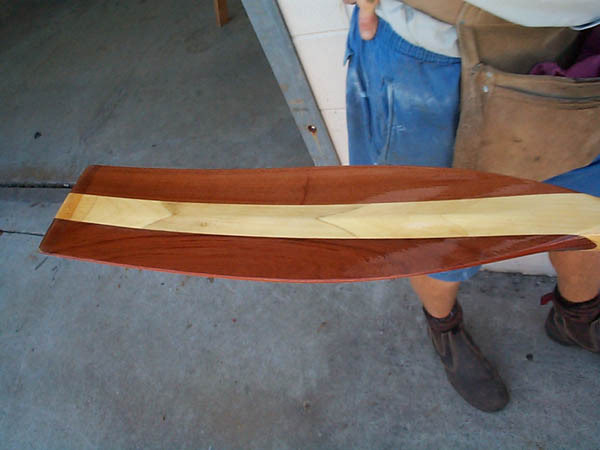 Now the tricky bit, the double concave face to capture the water during the stroke – an old plane was ground round and a simple timber plane was made. The planing itself was a delight, tight straight grain, redwood and hoop planed beautifully. Callipers were used to determine thickness, plus eye and touch. 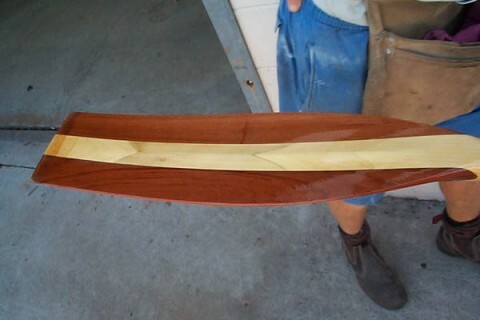 O.K., time for some sanding before a little epoxy and glass 100grm/sqm was folded over the fine tip. I quite enjoy hand brushing a marine varnish with a light sand between coats. The handles were left bare wood for grip. During sea trips in light surf at Currumbin Alley, Queensland – as the boat is a 2 metre surf boat – I manage to put some significant bend into one shaft without failure. General with and balance has been surprisingly good. 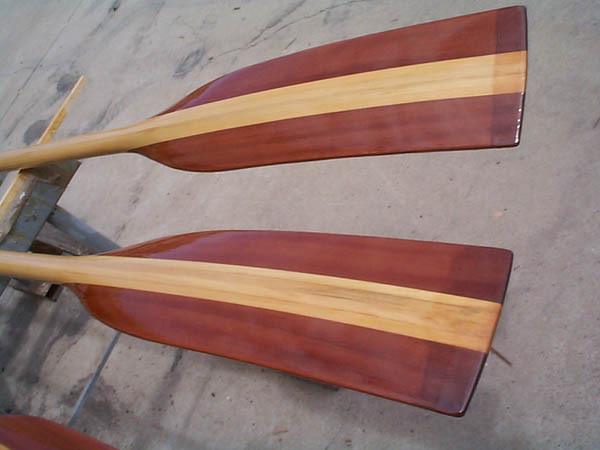 We can supply kits of timber for all sorts of spa’s including oars, masts, gaff, booms, fly poles etc.